Google Introduces Local 7 Pack, 10 Pack Dead? 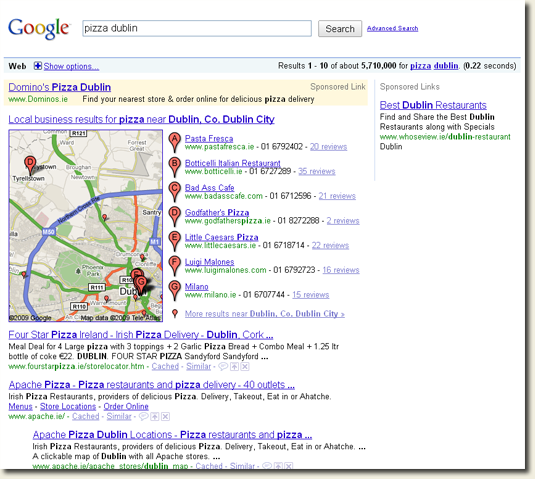 I wrote about the various Google local display types in my post How To Rank in Google Local, and I also looked at the result for [pizza dublin] at that time. Interesting to see that Apache have lost their #1 position to an inner page on Four Stars website. Funny, but that SERP is so diverse and full of inner pages that I’m surprised some of the pizza companies aren’t using SEO (if they are they probably should find a real SEO…). Will be interesting to see if this new 7 Pack stays, and if this heralds the end of the 10 Pack. I’m seeing the same as you (Google UK [web]), it looks better and is much easier to scan through the list comapred to the cluttered list of 10. Definitely less cluttered looking. If you had a previous listing that was 8th – 10th and quite content with that position, then this is a bit of a kick in the balls. No doubt that those companies in such a position and with poor organic listings will maybe think about turning to PPC. I’m sure this had nothing to do with Google introducing the 7 pack, not half. It looks much better and I am sure it will be much better for all that are listed now. I had a chat recently with someone who was in the ten list and as a result he said he wasn’t interested in SEO – why bother he said when i am at the top anyway? Maybe this will be a reason to bother. But the long term plan for most people working SEO must be to build out their own sites, esp the way consultancy is going just now. Then again if Yahoo! stop giving their results next year it might just make it interesting again. Any clue if this is the deal or if this is google hick up to change in a week or so? Also we were number 10 just prior to the 10 to 7 seven change (we vary from 1st to 10th over the last year) but was unlucky enough to be 10th just before this change. Also lost 90% of the previously listed customer reviews any clue why google dropped tons of reviews? Just saw this for the first time today. Is this a new PPC trick? Looks like a special maps listing, but it doesn’t appear on the map. Thanks for what you share in your blog. @Rob – agree that it’s easier on the eye. @Michael – I’d say that increasing revenues is always foremost in mind when they make changes, but I think they also make many changes in order to improve the overall Ux (which also increases revenues). @Leslie – for anyone dropped as a result of this change it’s going to be a bummer. @Atl Movers – this looks like the real deal to me. Changes aren’t generally rolled out to full population unless the change has been decided. @Becky – that’s a really interesting screenshot. Very interested to hear if you’re seeing this all the time and what query brought that up (also your location). Richard – I just started seeing it yesterday. The search was personal injury lawyer oakland. I’m in Colorado but have a client in Oakland that I was doing some research for. In any case, no, it doesn’t show in the map. It appears in the sponsored listings (paid search area) right above the map. The ad also appears to have three URLs. When I run it with SEMRush on so that the destination URL is displayed, there are three. Here’s another shot. I also saw it again for a few other searches. But the dots are also starting to join – did you notice that Google are offering custom phone numbers – “This call was brought to you by Google” – and you can start to see how Google Voice will likely integrate into their ads system down the road. Google really is going after business sector, and they are doing a pretty good job in many cases. Wow, very interesting. I’m about to launch a PPC campaign for a client and noticed it asking me if I wanted to link my ad to the client’s local business listing. When I finish it, I’ll let you know if I get a blue dot. Hi Richard. I’ve seen a lot of one box and three box listings turn into seven in the last few weeks. With ppc and local listings – actual seo results are almost half a page down. The fact that google local listings contain so many fraudulent listings is quite strange considering the work they put into keeping spam out of the regular serps. The problem is that they have to remove spam manually – it’s very difficult for them to know your business isn’t really called “Dublin Lock Smith, The Best Locksmith in Dublin” as that could be a legitimate business name. If you think about it you could really abuse the RBNs if Google decided to call your bluff. I’d say that over time you can expect results to get better and better as they roll higher quality signals into the ranking algo for local results. Anyone have any ideas how this happened???? This might be the answer to my previous question. Do you think this is how it happened?